Maccabi Haifa entered the game's cycle in an historic game on its' part against an anonymous team from Luxembourg, Dudelange. One goal by Alon Mizrahi (who later on became the most productive scorer in Israeli's soccer of all times, in the league and in European Cups), on the 38th minute was enough. In the return match of the early stage it was not a problem to beat the guests 6:1 from goals by Alon Mizrahi (2), Sergei Kandaourov, Reuven Atar, Shy Holtzman and Alon Harazi, who has the most appearances in Europe. On the 90th minute Haifa received a goal by Jerry Orhouse. In the second game, first stage, Haifa met a difficult opponent-Torpedo Moscow. Haifa's players, who never played against an East European team in a formal game, had the courage to stand bravely for 87 minutes without receiving a goal. But, Sergey Borissov broke the wall down and gave its' team a mild advantage towards the return match. Haifa was very optimistic, at least when Alon Mizrahi (sixth minute) cancelled the Russian's advantage with an early goal. But the joy lasted six minutes only, when Andre Claichev evened the score and forced Haifa to score twice more. The end supplied the drama. Haifa's Ukrainian stopper, Roman Petz gave his team their advantage back and on the 85th minute Shy Holtzman succeeded in scoring for the third time and sent Haifa to the dreamy stage in those days: last sixteen against the great Parma. Haifa, that was set to host first, fought with gnashed teeth against the excellent Italians that were able right at the end of the game (90) to score a free kick by Tomas Brolin. No one gave Haifa a chance in the return match. Parma was regarded as a typical home team but the thousands of spectators in the "Tardini" Stadium could not believe their eyes. Alon Mizrahi returned the interest with a goal (13) and the proud host fought hard not to lose. In the over time Rafi Cohen, Haifa's goalie, blocked a penalty kick and the teams prepared for the penalty kicks duel. The Italians won 3:1 and passed through to the quarter finals and from there to the finals and eventually won the European Cup that year. After winning the Israeli championship without losing the entire season (39 games) Haifa had great hopes of continuing to succeed in Europe. In the first stage they met the Austrian, Casino Saltsburg. Haim Revivo, who in days to come will become the star of the Spanish football club, Selta Vigo and the Turkish Fenerbahçe, gave Haifa its' first advantage with a penalty kick (47) and seven minutes to the end the Austrians turned the tables. Huter (83) and Mladnovich (88 penalty kick) gave a worthy advantage towards the return match. The hope remained through out the first half in the "Ernst-Happel-Stadiom" (0:0), but right at the beginning of the second one, Mladnovich scored twice and his friend, Nicola Yourchevich (78) removed Haifa for good. An honor goal by Alon Harazi (90) did not console anyone in the Israeli camp. 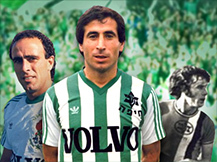 Oleg Koznizov, one of U.S.S.R's heroes who lost in the European Cup's final (1988), played for Haifa. Haifa returned to the third important tournament in Europe and early on met with Faroe Islands' representative, Klaksvík. When the latter arrived at Haifa, the hosts had no problem beating them 4:0. Three of the goals were scored by Alon Mizrahi (9, 36, 83 penalty kick) and Ofer Shitrit (65) completed the fourth. Due to lack of interest and a costly price, not even one Israeli media person went to the return match in the far Island. Along side "crazy" weather with rain and strong winds, Haim Revivo (32) was able to express his team's quality advantage. But, the local Holger Danielsson amazed everyone with three goals of his own (49, 58, 68) and put Haifa's win in question. Only one goal by Ofer Shitrit (82) calmed Haifa's players who made it to the first stage where they met, Sporting Lisbon (Portugal), no less. Forty thousands loud locals did not understand Haifa's lineup that came with the intent of winning in the lions' den. The price was high. Three goals by Barbossa (8, 10, 48) plus one for desert by Se-Pinto (88) wiped out any illusion to surprise. The return match was for protocol only (0:0). The first time Haifa made it to the UEFA Cup, it received only a short glance, two losses against the Yugoslavian, Partisan Belgrade, and a departure of Haim Revivo, who was soled to Selta Vigo. Georgia Sotlesich's scored the only goal (7) in the first encounter in Israel. In the return match Haim Revivo (28) scored his last goal as Haifa's player, but that did not scare the Yugoslavians who scored three times: Victor Trenbasky (35 penalty kick), Nisha Savlitz (53) and the Bulgarian Gorgy Hristov (83). 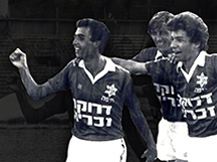 After one season Haifa did not participate in any European tournament, a rare view in the Israeli landscape, due to lack of success in winning titles, Haifa returned to its' most familiar tournament - European Cup Winners' Cup. Haifa left for Belfast and returned triumphant from the away game. It beat Glentoran 1:0 with a goal by Alon Mizrahi (22). Those who thought it is a weak team got a fascinating return match. Alon Mizrahi scored again (16), the guest Patty Betty tied (42) and finally Alon Mizrahi scored a penalty kick on the 80th minute. The next opponent was the top French team, Paris St-Germain, who was looking for revenge due to the fact that Israel's National team beat the French one in "Park De Prince" 2:3 in 1993, a loss that cost the French the 1984 World's Cup. Six of Maccabi Haifa's players played for the Israeli team. In front of 30 thousands spectators, the Israeli representative did not cave this time as well. On the 87th minute it was put in a difficult situation when Marco Simone scored a penalty kick, but Yossi Benayoun, a seventeen years old lad, who arrived that season to Maccabi Haifa, and in days to come will play for the great Liverpool, waited only two minutes to tie. In the return match the atmosphere was tense. Everyone waited for a surprise and Haifa did not fail. After 0:0 in the first half, a result that suited Haifa, Adoram Keissi, Haifa's defender, stirred things up with a header (70). Nicolas Aaoudek (72) tied, but again it was Alon Mizrahi who scored (78) and on the 87th minute Haifa's light was turned off when Jay-Jay Okocha scored the second French goal and with 2:2 Haifa is out. But, the over time smiled to the locals-Alon Mizrahi scored, a third goal in the French net and Haifa went crazy. As opposed to last time, against the Italian Parma, in the last sixteen Haifa received an Austrian representative, SV Ried. Alon Mizrahi (1998) put his team on the score board first (14), the local, Machi Selivovsky (23) did not give in and the Austrian star, Gerald Shterpner (88) headed an advantage on the way to Haifa. Kiryat-Elyezer, Haifa's home stadium, dressed up. 16 thousands spectators felt as if they are partners to making Israeli history, especially for Haifa. Their team did not let them down. Alon Mizrahi (33) and Adoram Keissi (61) set 2:0, Michael Anichich (70) scored, but Yossi Benayoun (75) and the Bosnian Ibrahim Dooro (90) killed any attempt to prevent Haifa from continuing to an historic quarterfinal. It should be mentioned that Haifa played for two minutes with 10 players, after Ofir Kopel (9) was sent off. Two minutes later the Austrians also lost a player and towards the end of the game another Austrian was sent off (88). Everything was set for Haifa's and Israeli soccer's ultimate moment. Even the tough Russian opponent, Lokomtiv Moscow, was not that scary and neither was the falling snow in the Russian Capital in March. Quarterfinal European Cup-a true dream. Unfortunately for Haifa, Alon Mizrahi, its' top scorer, insisted on being sold to a weak French team, Nice, of the second division and "the greens" had to search hard for a worthy scorer. 25 thousands spectators in Moscow could not see the difference in the first half that ended with no goals. But in the second one, Jaja DeJanshie scored three times (47, 77, 89) and wiped out the illusion. In the return match in Haifa it was Tchogainov who scored a penalty kick and Lokomotiv won 1:0. The Israeli representative set high standards for itself and for other Israeli teams. 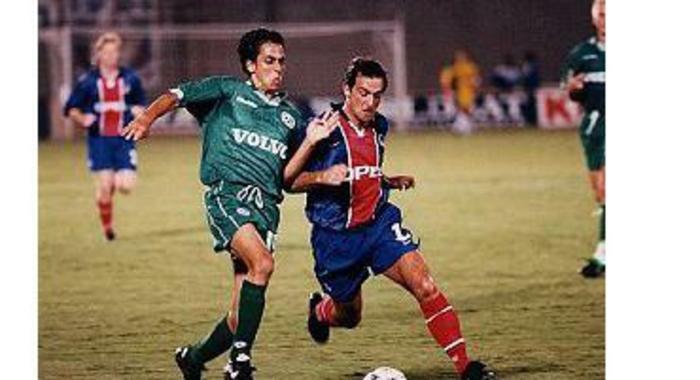 Haifa misses another year in Europe and returned in August 2000 to a double encounter in UEFA Cup against Slavia Mogeer (Belarus). Haifa finished the away game with a "good result" – 1:1 tie, when Yaniv Katan is the one scoring for it and three minutes later Alexander Shotov tied the game. The return match provided another tie, this time with no goals; it benefited Haifa that went on to the first round. Avraham Grant was Haifa's coach, he lead Haifa to two consecutive championships, then was released to coach the National Team and a few years later (2007) became Manager of the English Football Club, Chelsea. Haifa was unsuccessful in the game held in Arnhem, Holland, while collecting three balls out of its' net: Didie Martel (18), Bob Peters (62) and Mathew Amoha (90). Two of its' players, Adoram Keissi and Walid Badir were sent off within five minutes. Despite the defeat, allegedly, with no chance to turn things around, Haifa had a great opportunity to tie and send the game to over time. On the 86th minute it already lead 2:0 from goals by Avishai Jano (penalty kick) and Reuven Atar, but misses on one side and a goal by Mathew Amoha on the other, left Haifa empty handed. After winning the championship, at the end of seven drought years, Haifa found itself in the Champions ring where it played only once before. Even before it faced its' first opponent the Finnish, FC Haka, it knew that its' next opponent would be the great Liverpool. The opponent pushed Haifa to an away 1:0 win in Finland (Scored by Avishai Jano on the 28th minute by a penalty kick). In the return match in Israel, Haifa met a weak team and won 4:0-three goals by Yaniv Katan (56, 76, 90) and Giovanni Rosso (39). The excitement in Israel rose to new levels. The thought that 40 thousands fans would fill every corner in Ramat-Gan's Stadium, kindled the imagination. Liverpool in an official game in Israel? A dream comes true. But it was shattered. Apparently, one of Haifa's players, Walid Badir, was sent off one year before against Vitesse Arnheim, Haifa recalled he received a double sanction and a technical error prevented the mistake's correction. The win against Haka was annulled and Maccabi Haifa went to a state of shock due to the huge loss of missing hosting the English, not to mention the tremendous financial loss. The big disappointment encouraged Haifa, and this time it tried to do a thing no Israeli team has done before-make it to the Championship League. Every mission begins with one small step and that is the way Haifa referred to Belshina Bobruisk (Belarus). Unfortunately for Haifa, the security situation in Israel alarmed UEFA's institutions and decided that all Israeli team's games will be held outside state's lines. Haifa chose Cyprus as its' home court and only 200 spectators, most of them functionaries, arrived to see Haifa win 4:0, two goals by Rafi Cohen, Giovanni Rosso (45) and Ovydon Osholigon (85), a young Nigerian player that arrived, scored and returned to his home land. In the return match one goal by Haifa's Croatian, Nanad Pralia (8) was enough to pass on to the next stage against Austrian's Sturm Graz. The challenge was immense. A win and Haifa makes it to the group's stage. 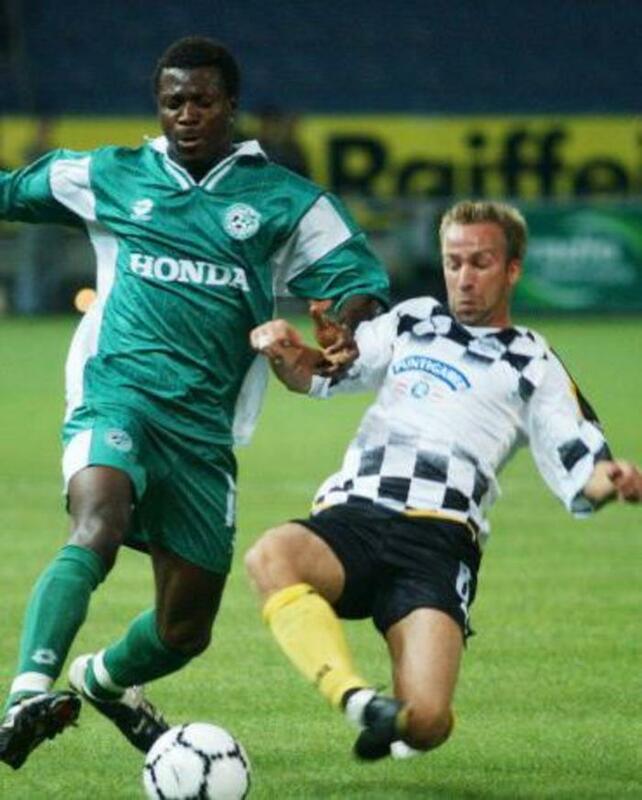 This time it "dragged" the Austrians to Bulgaria where it got a real advantage-2:0 by a couple of goals of the Nigerian star, Yakubu Igabini, who due to his talent later on was sold to England where he played for a few teams, one of them was Everton. The Austrians did not wave the white flag and did not look at the Israelis advantage as unbreakable. Eddie Bosner (11) set 1:0 to Graz, Giovanni Rosso scored a precious away goal (45), but then Imera Savich (57) and Noykirchner (74) threatened Haifa's advantage, especially when Igabini was sent off and left his team with ten players. But a precious goal by Haifa's defender, Adoram keissi (78), sent Haifa to its' historic moment. Walid Badir's tying goal (90) was nearly forgotten due to the historic advance to the next stage. The draw placed Haifa in a group with Manchester United, the German Bayer Leverkusen, and the Greece olympiacos. 63,439 spectators in Manchester's "Old Trafford" made wonderful scenery for Haifa's appearance and they were stunned when Yaniv Katan (8) scored first, but the advantage remained for two minutes only, when Ryan Giggs evened the score. Haifa tried not to collapse, but Ole Gunnar Solskjær (35), Huan Veron (46), Ruud van Nistelrooy (54) and Diego Forelan (89 penalty kick), had different plans. Haifa ended the game with a good feeling because Rafi Cohen's scored a second goal (85). The loss lowered Haifa's expectations and maybe that is the reason for the big "Boom" against the Greece olympiacos. Fans drove, flew and sailed to the game held in Cyprus again, and did not regret it for a minute. A wonderful game by Haifa, spiced up with three sophisticated goals by Yakubu Igabini, on the 26th minute penalty kick and two more (60, 86) that determined a first Israeli win in the Champions league. The fantastic win planted big hopes among the Israelis who wanted to win the next home game against Bayer Leverkusen (Germany). Haifa's enthusiasm did not express itself in the result, especially when Marco Bavich set 1:0 for the Germans 30 minutes into the game. The Polish referee gave Haifa a penalty kick, but Haifa's "expert", Avishai Jano, let it down when he kicked to the pole. 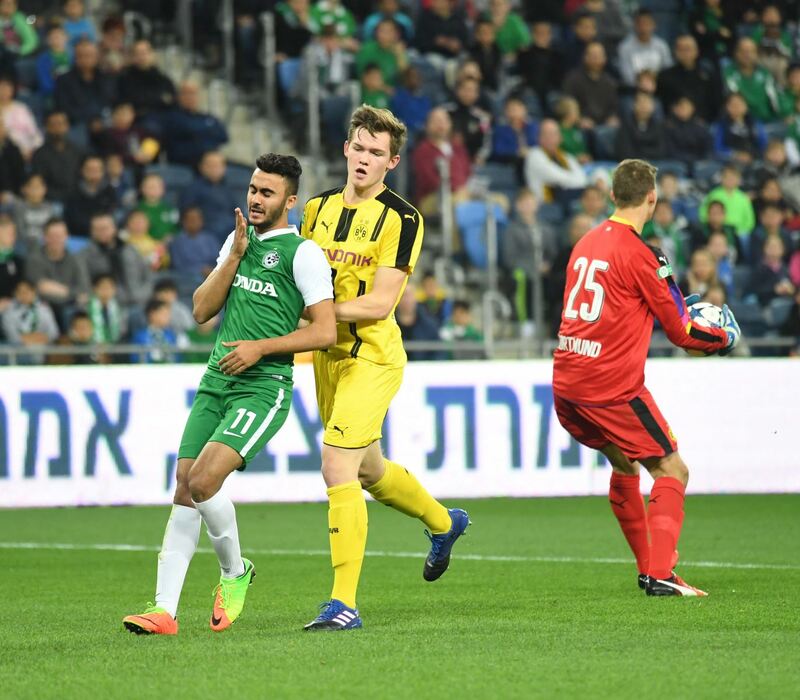 In the second half Haifa received a second goal by Bavich (63) and its' prospects towards the return match were not good. Up to the 45th minute the Israelis were good and again Marco Bavich gave his team an advantage on the 45th minute. Nanad Pralia, Haifa's Croatian, evened the game (53), but Juan determined the game's fate (67) and sent Haifa to compete for the group's third place. There were not enough places in GSP Stadium for all those who wanted to see the game against Manchester United. Haifa's biggest optimists rubbed their eyes while looking at the score board: Yaniv Katan scored again against United (41); Raymond Jotautas astonished from 30 meters on the 56th minute and then was fouled (75) and injured. Yakubu Igabini kicked the penalty kick and shook Europe up – 3:0 to Haifa. Haifa needed just one league point to assure the third place that leads to the UEFA Cup games and achieved it in a dignified way. In Athens against a typical home team as Olymoiacos. With in a minute Walid Badir (9) and Yakubu Igabini scored the first goals and gave their team a promising advantage. Alexandrisis (37) gave some hope to the Greece camp, but four minutes later Yaniv Katan increased the score to a two goals gap. In the second half, Ninadis (51) and Andos (79) tied to 3:3 and Haifa went on to play in the UEFA Cup again against a Greece team-A.A.Athens. An exhausted Haifa left for Athens and was on the verge of scoring. On the 12th minute Yakubu Igabini scored a penalty kick, but the referee ignored the fact that the ball's entire perimeter passed the line and did not approve the goal. One minute later Grigorious Giorgatous set 1:0 to Athens, Demis Nicolaidis (24), Milan Petakov (31) and Theodoris Zegorakis (35) collapsed Israel's representative completely. In the return match Walid Badir scored (5) an advantage that lasted 50 minutes. Ketsoranis equaled the score, Lakis added a couple more (80, 90) and Nalitzis completed the fourth in injury time. 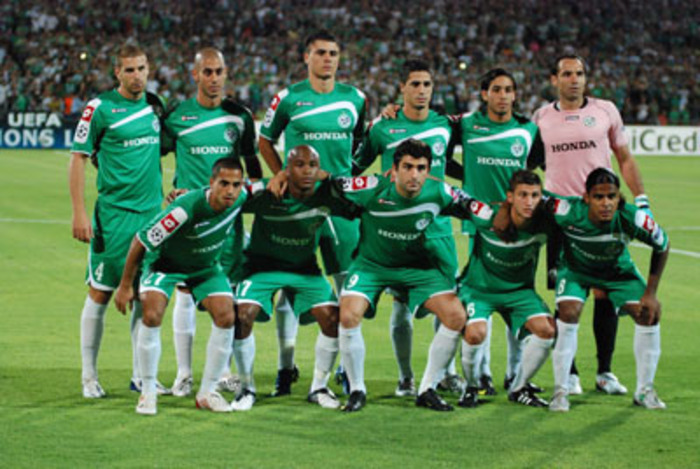 "Haifa" paid dearly for its' performances in Europe and did not win the Championship once more. It was missing two goals for the title, because Maccabi Tel-Aviv, the Champion, preceded it by just two goals. "The greens", along with their new coach, Haifa's former player, Ronnie Levy, had to play the UEFA Cup games. In the early stage they left for the Welsh Comvertown and returned with a 3:0 victory, goals by Idan Tal (8), Michael Zandberg (28) and Dante Lopez (90). It was Haifa's highest score victory in an away game in Europe. The return match ended in a similar result and was held in Izmir/Turkey due to UEFA's decision not to play in Israel, but that did not stop Yaniv Katan (37), Giovanni Rosso (45) and Michael Zandberg (62). Now they met a tough Slovenian team, Publikum, that enjoyed, like many others, the fact that Haifa does not play in its' home stadium. Only 200 spectators returned to Turkey (Izmir) to see Walid Badir (8) and Yaniv Katan (83) give Haifa a significant advantage that was wiped off minutes to the end due to a goal by Andrei Kavas. Both teams knew even before the return match that their next opponent would be the Spanish Valencia. The Slovenians lead 2:0 two goals by Robert Koren (42, 60), but Haifa responded with a couple of her own, Idan Tal (63) and Giovanni Rosso (84). For the first time in the club's history, Haifa continued to the second stage of the UEFA Cup. Valencia's appearance in the Mestalla Pitch would be unforgettable due to the appearance of Haifa's International goalie, Nir Davidovitch that was referred to in the Spanish media "the octopus". It was impossible for Valencia to score and Haifa used that advantage to end the game goalless. 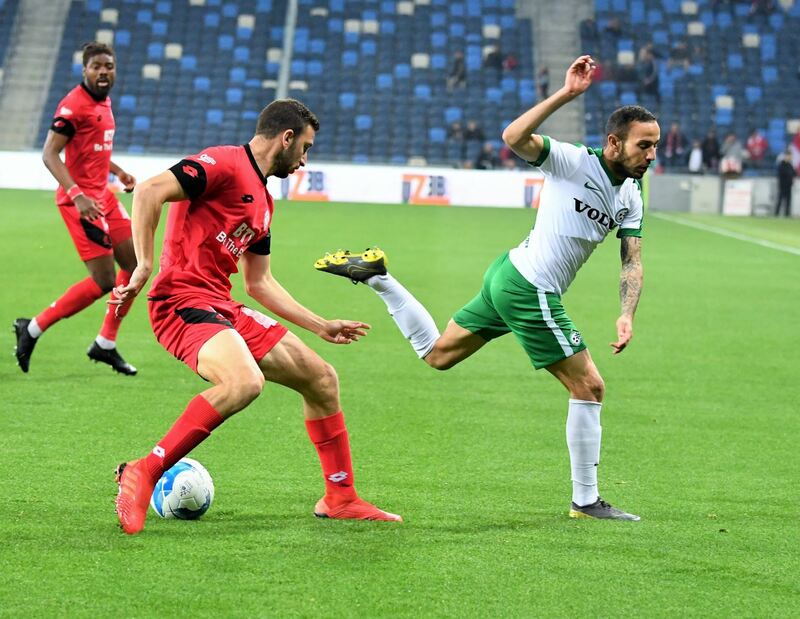 Haifa wanted to surprise in the return match as well, but had to play in Rotterdam, Holland, as their home stadium, it lost its' edge and was bitten 4:0 goals by Miguel Miste (11), Ruben Bracha (27), and two goals right at the end by David Elblada and Miguel Angelo. Haifa returned to the Champions League straight to the third round and met a tough opponent- the Norwegian Rosenberg. The Scandinavian hosts had a certain advantage because their season was already midway and Haifa just started. It cost Haifa two quick goals. Harold Bratback scored on the first minute; Gunar Soli added another one eight minutes later. But just when it seemed Haifa will fall apart, Giovanni Rosso scored (45). The second half ended goalless and the Israeli hope returned. UEFA agreed that the return match will be played in Israel. 30 thousands green fans pushed their team forward. On the 25th minute defender, Najuan Grayev was sent off, but it did not weaken Haifa's legs that within seven minutes lifted the entire stadium on its' feet. Walid Badir (31) and Gustavo Boccoli (38) gave Haifa the advantage it needed, but then arrived the tragic minute. A free kick on the last minute for the Norwegians kicked by Harold Bratback from 20 meters dragged Haifa to a disappointing overtime. Mentally broken down and with one less player, the visitors managed to score twice once by Daniel Braten (95) and then Urian Breg (115) sent their opponent to the UEFA Cup. Haifa did not break and won its' first game against Dnipropetrovsk (Ukraine) 1:0 when its' Argentinean scorer, Roberto Collauti (32) scored the only game of the match. But the small advantage was not enough in the return match. Dmitry Micaellenko (34) and Andrei Rossol (76) turned the tables and Haifa ended its' European chapter for this season. After winning another Championship, Haifa met the Swedish Malmo. Haifa arrived prepared for a tough game and already on the first minute Roberto Collauti scored. The Swedes tied by Ixel Osmenovski (34), but Collauti did not give up and scored again before half time-2:1 to Haifa. Three minutes into the second half (second round qualifying matches) the Swedish Daniel Anderson scored a penalty kick and then on the 68th minute the tables turned when Has Mateson determined 3:2 to Malmo. Haifa had two away goals and every reason to be optimistic. Especially, when in the return game Roberto Collauti (10) tied the general score. The visitor, Afonso Alaves (21) tied the game, but on the 60th minute Shlomi Arbaitman, Haifa's substitute, gave Haifa a second advantage and ten minutes later was sent off by a second yellow card after touching the ball with his hand. Just like the year before against the Norwegians, the 89th minute was cruel to Haifa that received a tie goal and said good bye to another European season, after only two games. Seven years after the opportunity to play against Liverpool was taken from Haifa, they received a second chance to meet "the red demons" from the Beatle's town. Haifa's players were excited after their historic performance in "Old Trafford", especially those who it's their first experience, Alon Harazi and Yaniv Katan, and stepped on to the dreamy grass in the mythological Anfield. The first game of the third round of the qualifying matches that was held in England was a sensation. Haifa's Gustavo Boccoli scored on the 29th minute an advantage that lasted just four minutes. Craig Balamy evened the score and in front of 40,000 local fans, Haifa stood bravely up to the 88th minute when Mark Gonzales scored the winning goal for the hosts. Again, due to the security situation in Israel, the return match was not held in Ramat-Gan. At the end of long searches Haifa decided to host the game in Kiev Ukraine. There, in the Valery Lobanovsky stadium, to the eyes of 1700 spectators, a few from Israel, the game ended in a 1:1 tie. But the last twenty minutes of the game were stressful for Rafa Benitez's players. Indeed, the giant Peter Crouch gave his team the advantage (54) and an away goal, but Roberto Collauti (63) tied the score and from here on the movement towards the host's goalpost became one-sided. The tie score sent Haifa to compete in the UEFA Cup. Maccabi Haifa wanted to play in the real thing, the group stage, a place where only one Israeli group played before, Maccabi Petach-Tikva. In order to do so, it had to face the Bulgarian team, Litex Lovech in…Holland, again due to security restrictions. The Bulgarians returned optimistic to their country after a 1:1 tie, when Yaniv Katan (7) gave Haifa some hope and Peter Dimitrov (51) took it away. But, in the return match, in Bulgaria, Haifa played excellently and left no doubt as to who should be in the next stage. Xavier Dirsau (19) with a huge goal from a distance, Alan Massudi (32) and Roberto Collauti (66) left Eljendario Sanderinio (37) just one honor goal. Ronnie Levy's team made another little peace of history. In the Groups stage Haifa did not have strong opponents: The Scottish Glasgow Rangers, the Serbian Partizan Belgrade, the French Auxerre and the Italian Livorno. All four teams were looking to finish in one of the first three places that give the ticket to the middle stage before the last sixteen. UEFA agreed to give Haifa its' home field back. But not all the way. They had to play 100 KM away from Haifa in Bloomfield stadium as their home field and Haifa's "Greens" turned it into real hell. The first team to suffer was Auxerre. 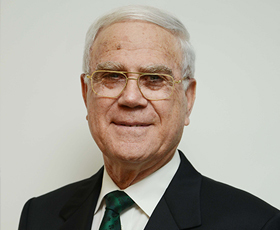 When Alan Massudi, Haifa's new foreigner scored first (13) the stadium shuddered from excitement. Daniel Nicola (29) calmed them down, but in the second half the hosts gave a true concert. Gustavo Boccoli gave Haifa its' advantage back (56) and two minutes later Roberto Collauti stack the last nail. The visitor, Stephan Grichtig was sent off (65) and Haifa had a flicker of hope that the mission to make it to the next stage is possible. This hope did not fade even when Haifa left to Glasgow's "Ibrox" and lost 2:0. The warm atmosphere of 50,000 spectators pushing their team resulted in a quick goal by Enzo Novo (5). Haifa did not fall apart. Its' goalie, Nir Davidovitch, blocked a penalty kick in the opening minute of the second half that was kicked by Chris Lloyd only on the 88th minute the Scots succeeded in doubling the score from another penalty kick given to them by the Cypriote referee, Costas Capitanis. This time Charlie Adam scored. The third game became critical. Haifa returned home and hosted the strong Partisan Belgrade. An early goal by Xavier Anderson, the Brazilian midfielder, put Haifa in an excellent place with six points. Haifa needed one point in the away game in Italy against Livorno to complete the task successfully. Christiano Lockarli gave Livorno the advantage (19), Haifa fought with gnashed teeth and right with the last whistle Roberto Collauti evened the score 1:1 and the joy was overwhelming: "the Greens" became the first Israeli team to make it to the next stage. In this high unprecedented stage Haifa was drawn against CSKA Moscow. The game was moved to the Spartak stadium in Vladikavkaz due to extreme weather in Moscow. 30,000 Russian fans made it to the stadium certain that Haifa would fail again against the Russian Capital's representative. Torpedo beat Haifa 1:0 and Lokomotiv beat it 3:0. Again Haifa did not score an away goal, but the result (0:0) signaled that Haifa might use its' home advantage in the return match. And they did make another historic move: A goal by Roberto Collauti (13) unanswered by the Russians sent Haifa to the last sixteen, where the Spanish Espanyol was waiting for it. In the first game Haifa's players struggled to take advantage of their homeliness (remember? Bloomfield? ), but the Spanish's strong defense left the two nets empty. In the return match in Barcelona's Olympic stadium Haifa did not give in, but once Ivan De La Penya scored the first goal (53), the Israelis tried to tie and gain an away goal that would send them to the quarterfinals. Instead, within one minute (60-61) two goals by Tomado and Louis Garcia wiped out all Israeli desire. Fandiany completed Haifa's defeat. In any case, for the second time in Maccabi Haifa's history it appeared in a dozen games in the European tournaments. Last time it occurred in 2002/3 season when Haifa played in the Champions League. The performance in the early stages of the Champions League was a formative experience for most players and of course for their coach, Elisha Levy. They never attended these games and there was doubt if they would succeed the three stages that lead to the Champions League. On the first game, "The Greens" met an old acquaintance, North-Irish Glentoran, in 98/99 Haifa beat it on the way to the last sixteen of the European Cup Winners' Cup. This time the road was easier. On the first game in Kiryat-Eliezer Haifa beat its' guest 6:0, two goals (57, 81) by the new Georgian, Vladimir Dvalishvili, Lior Refaelov (36), Yaniv Katan (52), Shlomi Arbaitman (83) and Mohammed Ghadir (89). The return match held in Belfast was no different. Indeed "only" 4 goals were scored but this was Haifa's highest away win in the European arena and overall it scored ten goals, an unfamiliar amount. The goals were scored by the Nigerian striker, Yero Belu (53, 8), who returned temporarily, Peter Masilela (62) and Shlomi Arbaitman (90). On the third round (Haifa's second) it wandered far to Kazakhstan to meet an anonymous team by the name of "Aktobe". In front of 13,000 zealous spectators Maccabi Haifa with a courageous game was able to transfer the decisive game to Kiryat-Eliezer (0:0). At home field with tremendous enthusiasm, a tie seemed reachable. But no one expected the return match to turn into such a huge drama as if taken from a science fiction movie. Within the first 15 minutes of the game Kazakhstan's team was able to collapse Haifa's defense and lead 3:0 scored by Avirichenko (8), Chikolin (13) and Chairolin (15). It seemed the sky was falling on Haifa, but Yaniv Katan's goal (26) and eight minutes later another one by Eyal Golasa (34) who entered as a substitute, gave hope that not everything is doomed. The masses ecstasy reached levels recalled only from the win 3:2 over Paris Saint-Germain in 1998. Vladimir Dvalishvili entered to action and within three minutes (59-62) turned the tables and lead Haifa to the playoff against Austria's Champion "Red Bull" Salzburg. Only a few believed that Haifa could reproduce the accomplishment from 2002/03 and make it to the Champions League at another Austrian team's expense (q.v. SK Sturm Graz 2002). But Elisha Levy's players arrived at the "Red Bull Arena" and won 2:1. Muhammad Ghadir scored first (22) the Austrians cooled the enthusiasm with a tying goal by Alexander Tsikler (57). Than Shlomi Arbaitman rose from the substitutes' bench and scored the winning goal (84) that gave a huge advantage towards the return match. That game was played in Ramat-Gan in front of 35,000 fans, because Haifa's home field, Kiryat-Eliezer, is unsuitable for European Performances. Israel Champion gave a concert, beat the Austrians 3:0 and made it to the Champions League. Vladimir Dvalishvili (31), Eyal Golasa (57) and Mohammed Ghadir (90) sealed the Israeli passport for the second time to the best league in the world, the Champions League. Here they found a bunch of teams that once we were exited just to see them on T.V. Italy's Juventus, German's Bayern München and France's Bordeaux. Only the last team, along with Haifa, came as Champions of their country, but second place in Italy and Germany is respectable enough, especially when teams that won the European Cup in the past are involved. No one promised Haifa an easy life; the team arrived to the tournament with many young and inexperienced players. As far as soccer level is concerned, on most games Haifa played as equal among equals, but the bottom line is they were unable to implement the many opportunities the players received, while the goalies, headed by Juvetus's Gianluigi Buffon, prevented any goal attempt. Haifa issued approximately 40 thousand subscriptions for its' fans towards the games in Ramat-Gan, and the latter bought them no questions asked, a phenomenon never seen in Israel yet. In the first game Haifa hosted Bayern München and there were no noticeable differences until the first goal scored by stopper Daniel Van Buyten (64). Two goals scored by Thomas Müller within three minutes (84-87) ended Haifa's dream to get off on the right foot. Haifa was optimistic when it left for the second game against the French Champion; it displayed an excellent game that brought it neither points nor goals due to the French goalie who prevented four-five goals. On the other hand, lack of luck, when Bordeaux's stopper, Michael Ciani, headed (83) the winning goal after a corner kick. The frustration caused midfielder, Biram Kayal, to be sent off and received a peculiar punishment when he was removed from two more games. Towards the third game against Juventus at Torino's "Olimpico" Haifa was quite confident. Again they "did not wet their pants" and gave in to a goal at the beginning of the first half (47) by the Italian stopper, Giorgio Chiellini (so far all the opponent team's stoppers scored). Haifa lost another midfielder the Brazilian, Tiego Doutra, who entered 12 minutes earlier and saw the red card after a harsh foul. Juventus arrived to Israel for the return match and again it left with a small 1:0 (Mauro Camoranesi) and the three precious points. 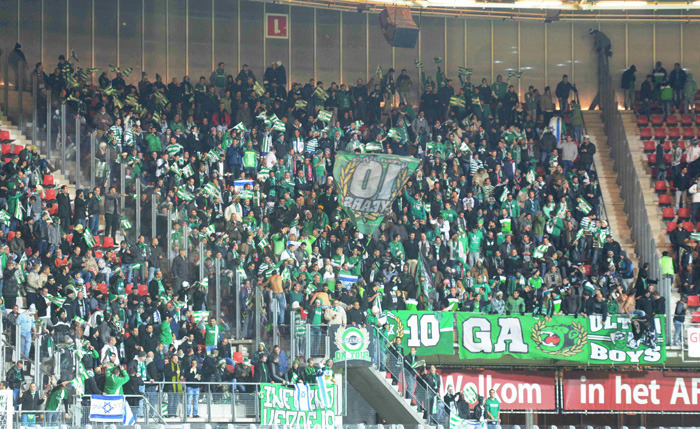 According to plan, towards the fifth game Haifa could only develop false illusions to beat Bayern München at the Alliance Arena in front of 60,000 of their fans. For the fifth time, Haifa played well, and had to watch, broken heartedly, how Ivica Olic (62) subdue Nir Davidovitch and was left with the compliments alone. Haifa waited vigilantly for the six and last game. And it was not alone. It had never occurred that a team ended its' way in the Champions League with no goals and zero points. Haifa prepared well for its' game against Bordeaux in Ramat-Gan and put great efforts not to enter the history books, from the negative aspect. The French came with a very absent lineup that included many bench players, since they already promised their place in the next stage. But, on the moment of truth, Haifa did not play well and barely jeopardized the French post. It saw the Brazilian, Jussie, score (13) and ends Haifa's campaign with five losses and a balance that will always be reminded when talking of a negative record. Nobody anticipated such a short romance with the new arena, the European League. It seemed as if Dinamo Minsk should not have been a difficult obstacle for Haifa's more experienced players in the European arena, but in soccer nothing is impossible. The players of the Belarusians Champion finished the first game in Haifa with mixed emotions. They were down 1:0 after Georgia's national scorer, Vladimir Dvalishvili, scored (30). It seemed lost for them when the same scorer scored again (27). But, goals by oleg stahanovich (35) and Anton Putilo (54) turned the tables and they lacked one goal to send Haifa home. At the final minute Putilo scored again and ended Haifa's part in Europe sooner than expected. The big disappointment of losing the Championship last season and the failed performance in the Europa League made way for renewed euphoria. Haifa won the Championship and laved towards its’ appearance in the Champions Cup. It went straight in to stage two against Bosnia’s Borac, the first encounter against a team from a Muslim country. On the first game in Kiryat-Eliezer, Haifa found itself in distress when the visitors scored first by Raspudi? (24), but Weeam Amasha’s tying goal (45) gave hope for the future. And that is exactly what happened. An amazing “Blitz”, rare on the European scene, caused Haifa to score three goals within three minutes, Amasha (71), Dela Yampolsky (72) and Amasha (73) again who completed a hat-trick, determined the game’s fate and Eyal Golasa (80) completed the warranty for the return match. The Bosnians believed in their odds and early on Branislav Kruni? (9) enhanced their hope. Vladimir Dvalishvili (24) tied, but Kruni? (34) gave the advantage back to his team. Dvalishvili struck back (53), but Haifa gave in to Nemanja Vidakovi? (84). The 3:2 loss did not prevent it from moving on. The second opponent, Slovenia’s Champion, Maribor, also came to Haifa for the first game. When Dvlaishvili set 1:0 from a penalty kick on the eighth minute, there was still doubt towards the future. Marcos Tavares (27) tied the game, but substitute Dela Yampolsky (70) gave a certain advantage towards the return match. Idan Vered (10) scored in Maribor, the same Tavares evened the score (32) and until the end Haifa got what it wished for, making it to the playoff game against Belgium’s Genk where Elyaniv Barda plays, Maccabi Haifa’s former scorer. UEFA did not give up to Maccabi Haifa and made it abandon Kiryat-Eliezer in favor of the National Stadium in Ramat-Gan. Haifa played beautifully, missed a lot and had to settle for a small win. Weeam Amasha (8) and Dvlaishvili (28) set 2:0 and the same Barda scored an away goal (61) that gave interest to the return match in Genk. The drama that developed there, made Haifa sense for the first in its’ history, just how cruel the white spot is, and nobody needs to convince Haifa just how “black” it is. During the game Genk scored first by Jelle Vossen (35) and was surprised when Eyal Golasa tied the game (37). Even before half time Thomas Buffel (41) scored. In addition, Haifa’s stopper, Itzik Cohen, was sent off (109), but not even that changed the game’s score. For the second time (previously in 1993 in Parma), Haifa, with awe and reverence, attended the penalty kicks where it lost 4:1. Dvalishvili and Golasa missed, Taleb Tawatha was the only one who scored. The implication of this ferocious loss is dropping to the Europa League and playing German’s Schalke 04, Romania’s Steaua Bucharest and Cyprus’s A.E.K Larnaca. It was the first time Haifa played against teams from Romania and Cyprus. The opening was optimistic. Haifa hosted Larnaca and won 1:0 by Mohammed Ghdir’s goal. The 3:1 away loss on the second game to Schalke did not discourage Haifa. Christian Fuchs (8) scored first, Idan Vered tied the game (35) and in the second half Fuchs set 2:1 (66) and Jurado (82) completed. On the third game a concert by Haifa in Kiryat-Eliezer - 5:0 against Steaua Bucharest. On half time Haifa led 3:0, goals by Amasha (10, 20) and Yaniv Katan (38 penalty kick). In the second half Taleb Tawatha (73) and Idan Vered (79) completed the job. Two Romanian players were sent off, one on each half. It seemed as if Haifa’s place in the next stage of the Europa League is guaranteed, but then came the fall. A loss to Steaua 4:2 in the return match. The Romanians already led 2:0 scored by Leandro Tatu (13) and Florin Costea (27). Eyal Meshumar (36) and Yaniv Katan (40) struck back and it seemed as if it would be enough for Haifa, but even Florin Costea’s sent off (61) was not helpful. Two goals by Cristian T?nase (64, 84) put an end to Haifa’s dream to ensure their place in Bucharest. And then another loss in Nicosia to Larnaca 2:1 at the GPS Stadium a place that gave Haifa fond memories from the performance in the Champions League (2002). Gonzalo García (14) and Gorka Pintado (51) prevented the illusion from Haifa and even a goal by the Croatian stopper Jurica Buljat was no comfort. Their last chance was on the last game. Schalke came to Kiryat-Eliezer already knowing it made it to the next stage. But yet it made no discounts to the Israeli Champion and beat it 3:0, goals by Buljat (own goal, 7), Ciprian Marica (84) and Andreas Wiegel (90). When the score was 1:0 Haifa’s Captain, Yaniv Katan, missed a penalty kick (72). 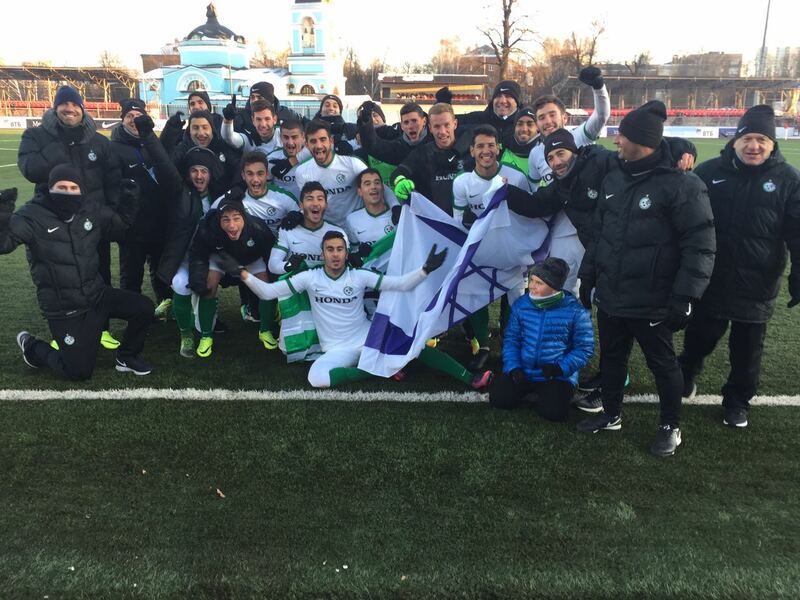 Maccabi Haifa returned to Europe by storm. Arik Benado's players opened the campaign with a record score for an Israeli team in Europe, a tremendous 8:0 against Khazar Lankaran in the return match and a total of 10:0 in both games. The greens continued to move forward towards the groups stage with impressive wins over Ventspils from Latvia and 2 wins against Astra Giurgiu at the playoffs of the Europa League. The groups' stage draw determined the greens will play against AZ Alkmaar, PAOK FC and the surprising FC Shakhter Karagandy that nearly beat Celtic in two games of the Champion League's qualifying round. The opening game summoned the greens a home encounter against AZ Alkmaar. Maccabi Haifa was preferable, but a late goal by Guðmundsson on the 70th minute set the game's score, 1:0 and sent the greens disappointed. The greens left for the second game to "Astana" stadium for an encounter against Shakhter Karagandy, the refreshing team from the Champion League qualifying round. In half time the greens were down by 2 goals (Finonchenko 40', Sranov 45') and were sure they'll come back to Israel without the points. But, the second half was all green and after a quick goal by Chen Ezra Maccabi Haifa was back in the game and Alon Turgeman sent an artistic ball from 22 meters to set the game's score 2:2. The fascinating game of the campaign was the third one. Benado's players left for "Tomba" stadium for an encounter against PAOK FC. The greens dazzled the Greece at the beginning with two quick goals by Ndlovu (13') and Eyal Golasa (21') to set a green advantage leaving the Greece without answers. The Greece scored on the 37th minute after a header by Vitor and before half time they already found the equalizer after a successful header by Ninis. In between, the Serbian goalie, Bojan Sranov, stopped Miroslav Stoch twice from the white spot. PAOK FC's zebras took to the field for the second half and on the 67th minute turned the tables after a header by Dimitris Salpingidis to set the game's score 3:2 for the hosts from Salonika. The fourth game of the group stage duplicated the prior one when the Greeks came to Kiryat-Eliezer. The greens were deep in their league struggles and the Greece also concentrated on their leadership struggles left their head in the league towards the game of the season against Olympiacos F.C. and parted with a disappointing 0:0.
. At the end Coach Arik Benado referred to the fans and said: "I want to send warm words to our fans that gave a cheering display that I don't remember". The last game of the group stage was for protocol only. Shakhter Karagandy and Maccabi Haifa lost any chance to qualify to the next stage and the game was played under stormy weather conditions. Maccabi Haifa was down a goal on the 44th minute after a successful penalty kick by Roger Cañas, but a blackout in the second half on the 59th minute changed the game's momentum and the greens came back 10 minutes within the darkness. The young Shoval Gozlan scored his Europa League's debut goal and Shimon Abuhatzira completed the changeover after a nice personal play to set the game's score 2:0 for the greens. The greens got their debut win at the last game and Coach, Arik Benado, referred to the campaign and said: "It was important to end with a win that was our goal today. In most of our European games we were preferable, many players proved themselves and it's food for thought".